The Canadian C-Spine Rule (CCR) is a decision making tool used to determine when radiography should be utilized in patients following trauma. The Canadian C-Spine Rule is applicable to patients who are in an alert (Glasgow Coma Scale score of 15) and stable condition following trauma where cervical spine injury is a concern. It is not applicable in non-trauma cases, if the patient has unstable vital signs, acute paralysis, known vertebral disease or previous history of Cervical Spine surgery and age <16 years. Negative Likelihood Ratio associated with this highly sensitive test is less than 5%. This means there is only a 5% chance that if you get a negative finding for this test, the patient would still have the condition. ↑ Stiell IG, Wells GA, Vandemheen KL, Clement CM, Lesiuk H, De Maio VJ, Laupacis A, Schull M, McKnight RD, Verbeek R, Brison R. The Canadian C-spine rule for radiography in alert and stable trauma patients. Jama. 2001 Oct 17;286(15):1841-8. ↑ Stiell IG et al. The Candian C-Spine Rule versus the NEXUS Low-Risk Criteria in patients with trauma. N Engl J Med 2003;349:2510-8. Baker R, Camosso-Stefinovic J, Gillies C, Shaw EJ, Cheater F, Flottorp S, et al. Tailored interventions to overcome identified barriers to change: effects on professional practice and health care outcomes. Cochrane Database of Systematic Reviews. 2010;(3):CD005470. Bandiera G, Stiell IG, Wells GA, Clement C, De Maio V, Vandemheen KL, et al. The Canadian C-spine rule performs better than unstructured physician judgment. Annals of Emergency Medicine. 2003 Sep.;42(3):395–402. Bhattacharyya OK, Estey EA, Zwarenstein M. Methodologies to evaluate the effectiveness of knowledge translation interventions: a primer for researchers and health care managers. Journal of Clinical Epidemiology. 2011 Jan.;64(1):32–40. Brehaut JC, Stiell IG, Graham ID. Will a new clinical decision rule be widely used? The case of the Canadian C-spine rule. Academic Emergency Medicine. 2006 Apr.;13(4):413–20. Canadian CT Head and C-Spine (CCC) Study Group. Canadian C-Spine Rule study for alert and stable trauma patients: I. Background and rationale. Canadian Journal of Emergency Medicine. 2002 Mar.;4(2):84–90. Clement CM, Stiell IG, Davies B, O'Connor A, Brehaut JC, Sheehan P, et al. Perceived facilitators and barriers to clinical clearance of the cervical spine by emergency department nurses: A major step towards changing practice in the emergency department. International Emergency Nursing. 2011 Jan.;19(1):44–52. Eagles D, Stiell IG, Clement CM, Brehaut J, Taljaard M, Kelly AM, et al. International Survey of Emergency Physicians’ Awareness and Use of the Canadian Cervical‐Spine Rule and the Canadian Computed Tomography Head Rule. Academic Emergency Medicine. Wiley Online Library; 2008;15(12):1256–61. Francke AL, Smit MC, de Veer AJ, Mistiaen P. Factors influencing the implementation of clinical guidelines for health care professionals: A systematic meta-review. BMC Medical Informatics and Decision Making. 2008;8(38):11pages. quick statistics for the media. ICBC; 2011 Sep. p. 1–16. Kelly A-M, Bradshaw L, Kerr D. Can nurses apply the Canadian C-Spine Rule? A pilot study. Canadian Journal of Emergency Medicine. 2004 May;6(3):161–4. Kerr D, Bradshaw L, Kelly A-M. Implementation of the Canadian C-spine rule reduces cervical spine x-ray rate for alert patients with potential neck injury. Journal of Emergency Medicine. 2005 Feb.;28(2):127–31. Li LC, Bombardier C. Physical therapy management of low back pain: an exploratory survey of therapist approaches. Physical Therapy. 2001 Apr.;81(4):1018–28. Mathur S, Stanton S, Reid WD. Canadian physical therapist' interest in web-based and computer-assisted continuing education. Physical Therapy. 2005;85(3):226–37. Menon A, Cafaro T, Loncaric D, Moore J, Vivona A, Wynands E, et al. Creation and validation of the PERFECT: a critical incident tool for evaluating change in the practices of health professionals. Journal of Evaluation in Clinical Practice. 2010 Dec. 22;16(6):1170–5. Michaleff ZA, Maher CG, Verhagen AP, Rebbeck T, Lin C-WC. Accuracy of the Canadian C-spine rule and NEXUS to screen for clinically important cervical spine injury in patients following blunt trauma: a systematic review. Canadian Medical Association Journal. 2012;184(16):E867–76. doi:10.1503/cmaj.120675. Pearce J, Troughton D. Survey-Rehab Practices Throughout the Continuum of Care for Clients with Total Hip/Knee Arthroplasty. 2006. Rebbeck T, Liebert A. Clinical management of cranio-vertebral instability after whiplash, when guidelines should be adapted: A case report. Man Ther. 2014:1–20. doi:10.1016/j.math.2014.01.009. Stiell IG, Clement CM, O'Connor A, Davies B, Leclair C, Sheehan P, et al. Multicentre prospective validation of use of the Canadian C-Spine Rule by triage nurses in the emergency department. Canadian Medical Association Journal. 2010 Aug. 10;182(11):1173–9. Stiell IG, Clement CM, Grimshaw J, Brison RJ, Rowe BH, Schull MJ, et al. Implementation of the Canadian C-Spine Rule: prospective 12 centre cluster randomised trial. British Medical Journal. 2009;339:1–7. Stiell IG, Bennett C. Implementation of clinical decision rules in the emergency department. Academic Emergency Medicine. 2007 Nov.;14(11):955–9. Stiell IG, Clement CM, McKnight RD, Brison R, Schull MJ, Rowe BH, et al. The Canadian C-spine rule versus the NEXUS low-risk criteria in patients with trauma. New England Journal of Medicine. 2003 Dec. 25;349(26):2510–8. Stiell IG, Wells GA, Vandemheen KL, Clement CM, Lesiuk H, De Maio VJ, et al. 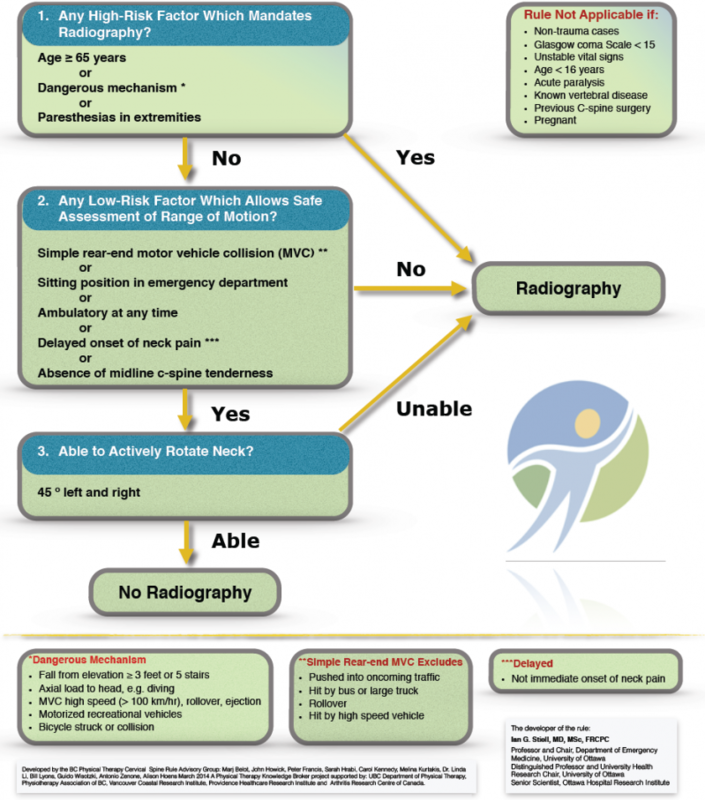 The Canadian C-spine rule for radiography in alert and stable trauma patients. JAMA: the journal of the American Medical Association. Am Med Assoc; 2001;286(15):1841–8. Stiell IG, Lesiuk HJ, Vandemheen K, Worthington JR, Verbeek PR, Reardon M, et al. 1999 SAEM Annual Meeting Abstracts. Academic Emergency Medicine. 1999 May;6(5):435. Vaillancourt C, Stiell IG, Beaudoin T, Maloney J, Anton AR, Bradford P, et al. The out-of-hospital validation of the Canadian C-Spine Rule by paramedics. Annals of Emergency Medicine. 2009 Nov.;54(5):663–671.e1.